There are more than 5 million people with Alzheimer’s disease in the United States and 35 million worldwide. These numbers are expected to skyrocket to a projected 13.8 million and 115 million, respectively, by midcentury. The potential of earlier diagnosis and the development of better treatments may significantly change the experience of Alzheimer’s for millions of people. In the meantime, the cost of care will rise dramatically. These factors will provide unprecedented challenges and opportunities for the Alzheimer’s Association. Never has the case for accelerated progress been more urgent. In the United States, 10,000 baby boomers turn 65 each day, and the 85- plus population is one of our fastest-growing segments. 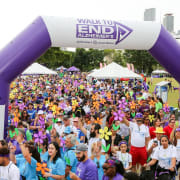 While Alzheimer’s costs $259 billion in the United States alone, this number will increase to $1.2 trillion by 2050 unless we find a way to prevent, treat or delay the disease. The already high cost of Alzheimer’s will continue to rise as the baby boomers age.